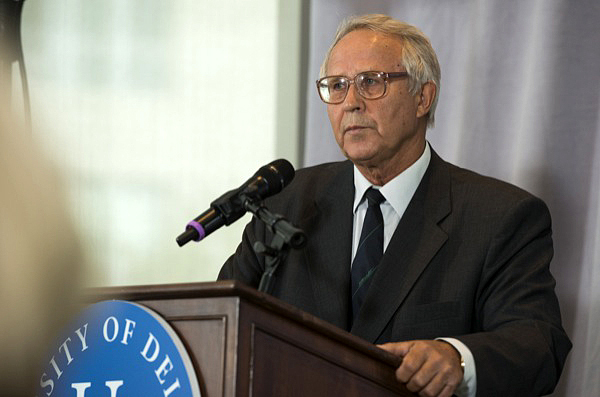 Viacheslav M. Andreev, who, along with Zhores I. Alferov, received the 2013 Karl Böer Solar Energy Medal of Merit. 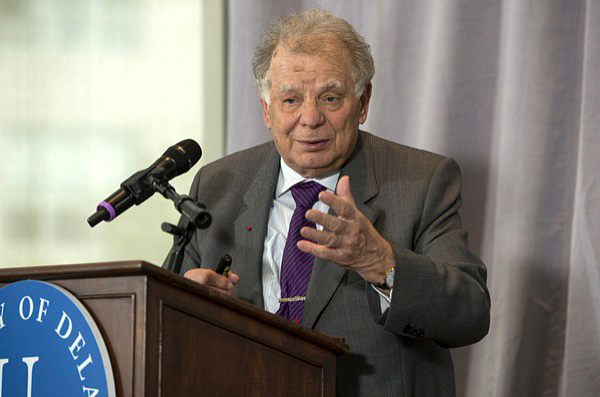 Zhores I. Alferov, who, along with Viacheslav M. Andreev, received the 2013 Karl Böer Solar Energy Medal of Merit. Medal namesake Karl Böer (front) with (from left) Zhores I. Alferov, Viacheslav M. Andreev and David Renné. Pictured following the award presentation are (from left) Viacheslav M. Andreev, Klaus Thiessen and Zhores I. Alferov. 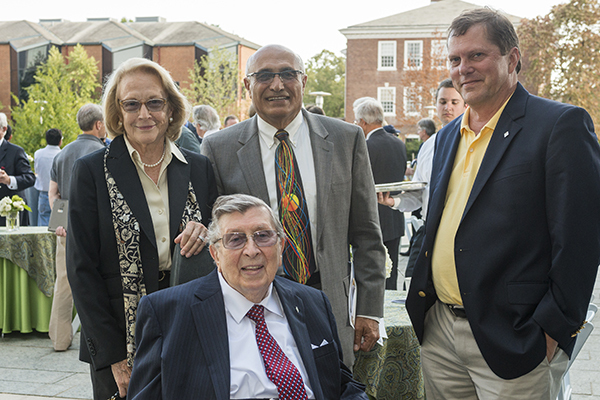 Medal namesake Karl Böer (front) with (from left) Renate Böer, George C. Hadjipanayis and George Watson, dean of UD's College of Arts and Sciences. 11:28 a.m., Sept. 26, 2013--Zhores I. Alferov, Nobel laureate, professor and president of the St. Petersburg Academic University of the Russian Academy of Sciences, and Viacheslav M. Andreev, professor and head of the A.F. Ioffe Physico-Technical Institute in St. Petersburg, Russia, were awarded the 2013 Karl Böer Solar Energy Medal of Merit during a ceremony held Friday, Sept 20, in the University of Delaware’s Interdisciplinary Science and Engineering Laboratory. The award is given in honor of Karl Wolfgang Böer, a longtime University faculty member, founder of UD’s Institute of Energy Conversion and a distinguished scientist in the field of solar cells. George C. Hadjipanayis, Richard B. Murray Professor of Physics and Astronomy, welcomed members of the Böer family, members of the campus community, and many internationally recognized leaders in solar energy research and public policy to the ceremony. University President Patrick Harker joined Karl Böer in presenting the awards, noting that the occasion marked the 20th anniversary of the first award ceremony. 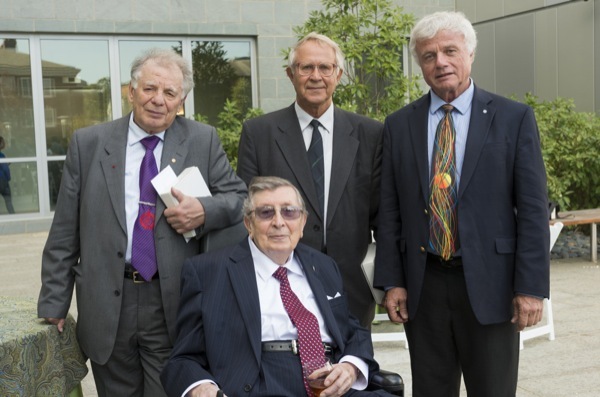 In the succeeding decades, the Böer Medal has recognized nine more significant contributors to the field including researchers and scientists, leaders and advocates and pioneers who pushed the boundaries of solar science, Harker said. David Renné, president of the International Solar Energy Society, lauded the 2013 Böer Medal recipients while giving a brief overview of the organization. Klaus Thiessen, photovoltaics consultant with WISTA-Management GMBH, noted that the occasion marked the second visit to UD by Alferov, coming 45 years after he attended the International Conference on Luminescence held in Newark. That event had been organized by the late Dr. Ferd Williams, then chair of the physics department, who had invited Böer to join the UD faculty in 1962. Thiessen noted that Alferov and Böer were both honored in 2012 with honorary doctorates at the distinguished Technical University in Berlin. Citing a 2007 report by Alferov and Andreev, Thiessen gave a short overview on their contributions in photovoltaics research and development. 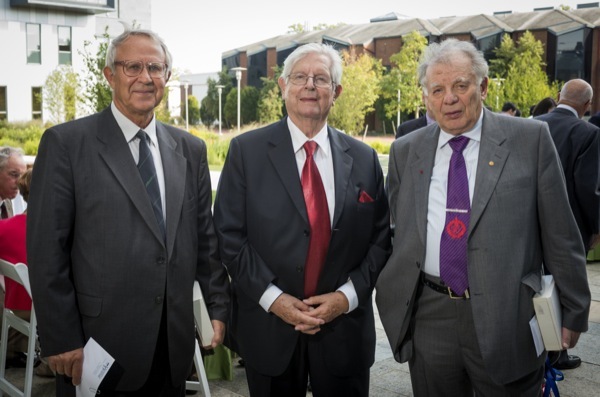 The contributions of solar cell pioneers Alfervov, Andrev and Böer continue to resonate today, Thiessen said. During the first of the award lectures, “Will the Future Markets Have Either Silicon or III-V Heterostructures or Both Together,” Alferov outlined the history of solar energy research and his views on the growing role solar energy will play in meeting the world’s energy needs. In his lecture, “Concentrator Photovoltaics: Status and Perspectives,” Andreev discussed activity in that field, which started 45 years ago and continues with the discovery of new ways for improving the efficiency of multi-junction solar cells. There are many ways for improving the applications of the multi-junction solar cells, and also many advantages of developed concentrator photovoltaic installations compared to silicon and thin film arrays, Andreev said. “There is a decrease in the amount of consumable materials and amount of land needed for the installation of concentrated photovoltaic (CPV) systems,” Andreev said. “The best place for systems are the places with the highest sunshine, especially in southwest North America and the Mediterranean Sea area, and places in the south of Russia. ¥	2011, Richard M. Swanson, president and chief technical officer at SunPower Corp., San Jose, Calif., for the invention of the point contact solar cell, and further innovations that make solar energy ever more efficient and cost effective.